Yes, the weather is chilly, but fresh-tasting dishes like bulgur salad with halloumi still find a way into my kitchen. This salad is packed with lots of wholesome, fresh flavors — ones that take you back to warmer days. As a barbecue staple, halloumi doesn’t often make its way into my kitchen, but sometimes it’s just the perfect thing to satisfy the craving for something salty. 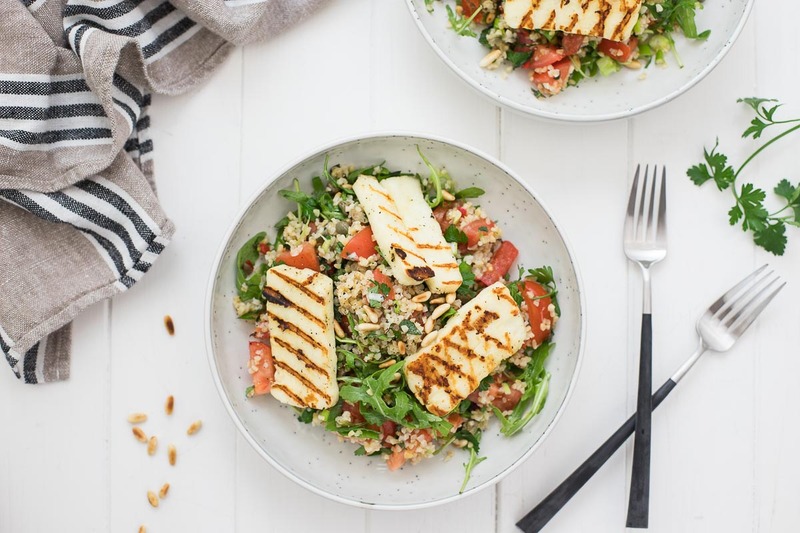 Which is what brought me to this tasty bulgur salad with halloumi fried to perfection, together with rucola, fresh herbs, sweet tomato, green onion and pine nuts tossed together with in a tasty lemon-caper dressing. Totally adaptable, this is a quick vegetarian salad recipe that you make your own. My favorite way to enjoy halloumi’s golden crust and chewy center is in a salad is with grilled eggplant and cherry tomatoes. A dream team. Bulgur is a classic for salads, like tabouleh, which are terrific with fresh herbs and tomatoes. But there are so many other grains that are perfect in salads. So try quinoa, Grünkern, or barley. All delicious choices. The simplest way to cook halloumi is to just fry slices in a dry non-stick skillet or grill pan. There’s no need for oil, in fact dry-frying helps create a nice golden crust on the outside while keeping the inside soft and perfectly ready to add to the salad. Thanks to the low levels of acid in this cheese, it remains firm on the outside and instead of melting, it browns instead. Which is exactly why it’s such a great popular choice for summer grilling. No need to wait until summer, it’s fantastic anytime of year! 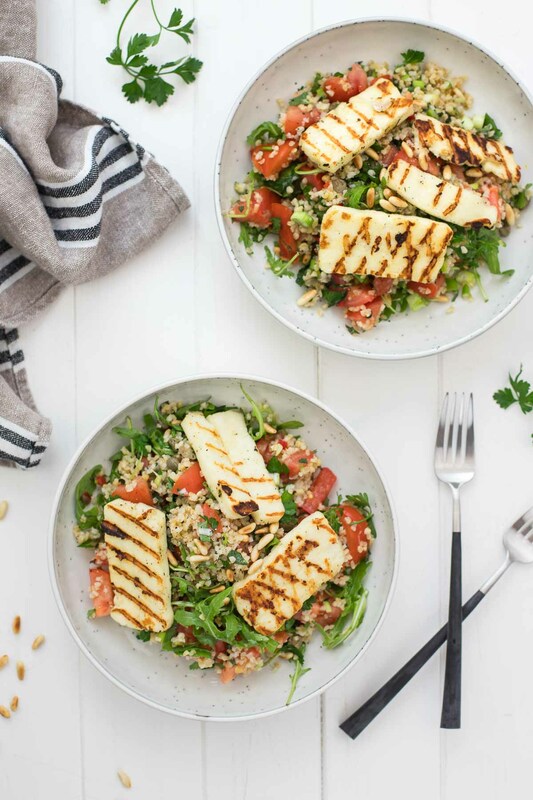 Packed with fresh flavors, this quick and delicious bulgur salad with halloumi can be enjoyed anytime of year. Cook bulgur according to package instructions; in lightly salted water for 10 minutes, until tender and fluffy. Transfer to a serving bowl to cool. In a small bowl, whisk together the olive oil with the lemon juice, capers, chili and garlic. Season with a little salt and pepper. Heat a dry, non-stick frying pan (or grill pan) over medium to medium-high heat, and gently fry the halloumi slices for about 2-3 minutes, until golden and crispy on both sides, turning carefully. Add the arugula, herbs, tomato, and green onion to the bowl with the bulgur; toss to combine. Pour over the dressing and toss again. Transfer to salad plates, garnish with the pine nuts and top with the halloumi slices. Enjoy! If you make this Bulgur Salad with Halloumi and Lemon-Caper Dressing recipe, I’d love to hear how it turned out for you! Be sure to rate it and leave a comment below to let me know! Especially if you have tips for other readers. Or take a picture and tag me on Instagram @ellerepublic and don’t forget to hashtag #ellerepublic so I don’t miss it!